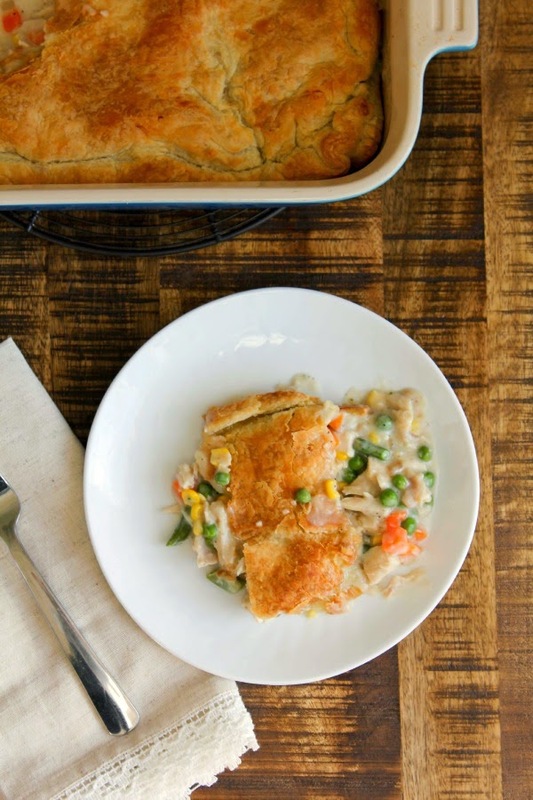 A rich and creamy homemade chicken pot pie topped with a flaky puff pastry crust is the ultimate comfort food no matter the time of year! I know I said a couple of weeks ago that I was moving away from heavy winter food and thinking spring, but last week chicken pot pie was calling my name. 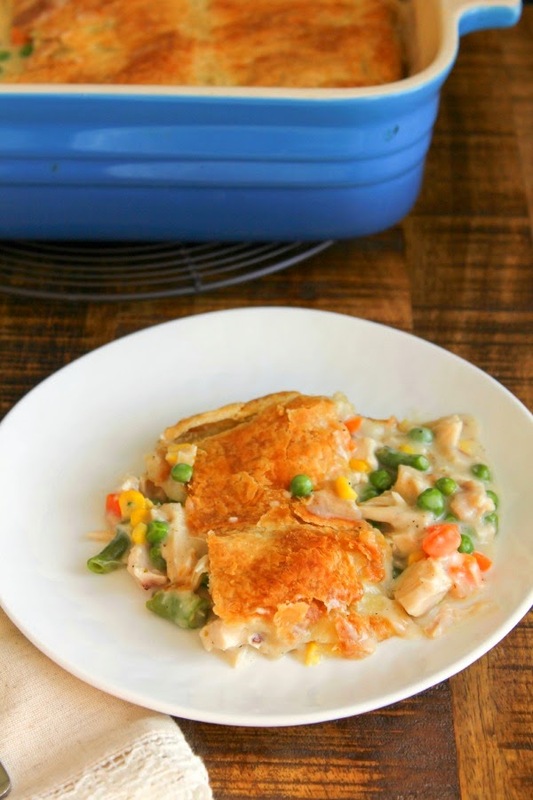 And not just any chicken pot pie, a rich and decadent pot pie made with a fancy puff pastry crust. Because puff pastry is life. And no canned soup was involved. A delicious, yet simple, creamy sauce was made. This pot pie is a game changer, people. And it's much easier to make than you think! Give it a try. Your family and friends will be coming back for seconds! In a large skillet, melt the butter over medium heat. Add the onion and cook for about 2 minutes, until the onion is tender. Stir in the flour, salt, pepper and oregano until well blended. Slowly stir in the broth and cream, cooking until bubbly and thickened. Stir in the chicken and mixed vegetables and allow to heat through for just a few minutes. Remove the pan from the heat and set aside while preparing the dough. Roll both pieces of the puff pastry dough out onto a lightly floured board, just enough to fit in a 9x13 inch pan. Spray the bottom of a 9x13 inch casserole dish with nonstick spray. Lay one of the pastry sheets in the bottom of the pan and press gently down and slightly up the sides. Spoon the chicken mixture on top of the dough. Top with the second crust, and push down to pinch the two edges together. Cut four slits in the top crust. Bake for 35-40 minutes, or until the crust is golden brown. Let rest for 5 minutes before cutting and serving.